The Small Business Association of Michigan supports the broadening of eligibility criteria to participate in the Medicaid program so that people under 138 percent of the poverty level can be covered. SBAM may be considered a surprising voice in support of this effort. However, I’ve been at the intersection of small business health insurance coverage and public policy for many years. We had something of an organizational epiphany about a decade ago, when I came to realize that the uninsured really matter to business. The reality is that people go to our health-care system and they get care, and if they can’t afford it, they still get care but it’s uncompensated. Uncompensated care actually gets passed along to those who can pay. It’s called cost shifting and it’s been happening for a very long time. And it has found its way into the base rates of health insurance for small businesses all across the state. Rob Fowler is president of the Small Business Association of Michigan. It’s a terrible business model to take a growing burden of people who come to the health-care system without compensation and shift it to a shrinking group of people – small business owners – who can still afford to pay for health insurance. We support expansion of Medicaid because we believe it ultimately can reduce the sort of piling-on effect that’s been happening to paying customers for many years. Currently, Michigan hospitals end up providing more than $880 million a year in uncompensated care to patients who are unable to pay. These costs end up being shifted to people who have insurance, employers who pay for it for their workers and taxpayers. I believe opponents of expansion are approaching this issue from two sincerely held, but misinformed, perspectives. First, that Michigan’s participation in Medicaid expansion somehow confers approval or acceptance of the federal Affordable Care Act. SBAM opposed passage of the Affordable Care Act and rooted for the U.S. Supreme Court to overturn the law. But that didn’t happen. President Obama’s re-election ensures that the Affordable Care Act will remain the law of the land until at least 2016. We don’t like it, but we’re realistic enough to accept that we have to play the hand we have been dealt. Second, there is concern that expanding Medicaid eligibility puts Michigan on the hook for a large amount of future financial liability. But, as Gov. Rick Snyder has stated, Medicaid expansion would save the state $200 million a year initially, as more people who receive health care and mental health services from state-funded programs get covered through money from the federal government instead. The governor has proposed putting half of the money saved into a health savings account that would help cover the state’s increased share of costs when the federal government scales back its funding for the Medicaid expansion. If the federal government does not keep its commitments in the long term, then the state will be scaling back the Medicaid eligibility. This has happened before and can happen again. Medicaid expansion makes good business sense for Michigan’s government, its businesses and, most obviously, its uninsured – because getting coverage for the uninsured matters to business. Your position is exactly the same as Walter Reuther's. Universal healthcare was a dream of his. The idea goes that if everyone is insured, everyone will receive the wonderful care that we all enjoy now. However, as Ronald Reagan pointed out then, that putting the government in charge of our healthcare leads us down a road of rationing and cutting procedures for the young and old. It also displaces the healthcare worker, for if the government can tell a doctor what procedures to perform, it's not a long time before the government is telling that doctor where he can perform them, where to live, and so on. So, in your staunch defense of expanding a failing and rationing program such as Medicaid, you should at least know that you are standing for the strengthening of government, which is of course, the antithesis of a free market. You can take your pick, either you are for small business, or you are for big government. I am a doctor, and I can tell you, he is right, you are wrong. Healthcare is rationed now, don't think that it is not. Those without health insurance suffer an economic rationing, as they do not get much if any healthcare except through the ER. Less than ideal, and more costly in the long run, not just in dollars, but in lives. And those with insurance, well, the insurance company does not tell you what you can and can't do, but what they will pay for. And most people can't pick what is not paid for, they can't afford it. So raising the specter of rationing is the same old Republican fear mongering. So is pitting big government against small business. The bigger government gets, the less freedom the markets have. government never does anything efficiently, and when the elderly or the disabled are refused because there is not enough money from taxpayers, and don't kid yourself, Rob, we can't give the government enough money to sustain good care for everyone, you will still be there to assure them that government cares, just not really enough. Go ahead and argue in favor of a federal government that is already trying to figure out how to confiscate more of people's hard earned money, run it through and pay government first, then see what is left over for the poor, the disabled, the elderly. We, as a nation cannot possibly deal with 90 Trillion in unfunded liabilities right now. Heap more onto the system, with 6 out of 10 doctors saying they will retire early, and the results will bring massive change alright. We workers will be working for government in a slave/master relationship. Expanding any government program takes away people's freedom, and it is anti-American. Don't kid yourself. Health care is already rationed. it's just rationed in favor of the well to do vs. the poor. Attempts to equalize accessibility like this scare those who already have it creating almost the same kind of conversation as the number of blocks one child has vs. another. Thing here is - the blocks aren't finite. Better health care upfront means more blocks for everyone. Please look at the tax rates and additional taxes for countries that have "free heatlhcare" and tell me how anyone will be able to spend money at my small business (which according to Canada for example) sells "luxury" items taxed at an extrememly high rate? Furthermore, please tell me who gets stuck with the bill after the Feds stop covering all costs of this expansion? It's me and my small business. Obamacare will not increase access to care for the poor or anyone else - in fact it will attempt to control costs by care rationing (especially for the old and infirm), wait times to see doctors for all people will increase, already we have insurers warning of rate increase set to go up 100-200%, it is now projected to add trillions to the debt (which is already $16 trillion dollars not counting the promises we have already made to other people). None of this is good for small business - shame on the SBA for taking this position, selling out the future of the nation for a couple years of federal pennies from heaven. @Rob - since you are a doctor - could you please tell us where so I may direct all Medicare and Medicaid patients your way (since many docs have stopped taking these insurance plans since the govt reimbursements don't currently cover the costs of providing the services). There are many ways to control costs and expand access that do not involved government. I encourage you to seek out and read the Reason Magazine article about the doc who operates on a cash basis for many of our most needed services. Costs way down and satisfaction way up.....that's just a start to fixing what ails us....Also, preventative type care is not always shown to decrease costs as folks like John are so fond of saying. Medicaid is cruel. It has the worst outcome of all insurance plans. It even has a worse outcome than people who have no insurance. It's cruel to expand it. The geniuses in D.C. and in the States' Capitols would mess their pants if they were forced to go on it. Not to mention it's on an unsustainable path to bankruptcy and many good physicians don't even accept it b/c it doesn't pay enough for all their time and training! It's horrible from start to finish. Only bureaucrats and tyrants can yuk-yuk this one up.... we all know obamacare's end game is Medicaid for all. It is disappointing that Mr. Fowler is distorting the issue. Medicaid is not a health care system, it is a medical care system. The Medicaid system is paying for medical treatment. individual health has as much or more to do with personal lifestyle choices than it does with medical treatment. It is surprising that Mr. Fowler and the SBAM only sees the answer to public health is to throw money at the system and ignore the causes of the problem. Having worked at a large company we were taught and expected to look at the causes not to simply spend on the symptoms. This include the health and safety of employees and contractors. By investigating and addressing the causes that employer has been able to become one of the safste and healthy (employee and contractors) place to work recongized by the regulating agencies, peer companies decades ago and maintain that success today. It seems that Mr. Fowler/SBAM have a different 'business model'. It appears Mr. Fowler and the SBAM 'business model' is to be competitive they need the general public to pay for their costs rather than help their employees to better health. It is disappointing that Mr. Fowler/SBAM and other businesses aren't bring the business practices and processes to the issue of public health the way they apply it to the development of products and services and customers. Well said. I'm pleased to see SBAM holding this enlightened --and quite realistic-- position. Now go to work on the legislature! I am a small business employer and I pay for health insurance for our employees, their spouses and all children living at home. These Fox News listeners here, that don't know what they are talking about, have not experienced what I have all of these years. I am paying for all of the people that don't have insurance with premiums that have gone up by double digit rate increases, every year, for over a decade. It is safe to say that my costs have gone up over 140% for our health care premiums. Yes I support Medicaid Expansion as I am tired of paying to subsidize those that do not have insurance. You can spout your freedoms all you want but, I look at you as being selfish. Most of the people that are on Medicaid are the working poor. They work multiple jobs and their employers will only hire them part-time so that they don't have to pay for any benefits. Walmart is a classic example of an employer that gets away with this. The Waltons are worth billions of dollars but they will not pay their employees enough to have health insurance. If you who are not willing to help your fellow man out or, do not want to be forced to pay for something you do not want, like health insurance; please let us all know. Please sign a statement that the hospitals don't have to treat you at all if you are in an accident. I get tired of people claiming that they want to be free but won't accept responsibility for what that really means. If you truly want to be free then, we don't owe you a thing. 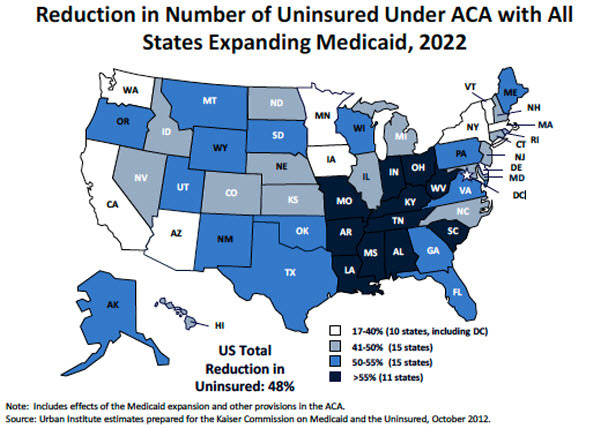 In the mean time do the math; Medicaid Expansion will save the state $200 million dollars per year. If this is not passed, the state General Fund will be $103 million in the hole this year. That will be made up by losing more roads, school aid and many other things that our taxes do pay for. We're paying the lowest level of taxes we have in years, all because the well off want to be greedy. But that's another story.